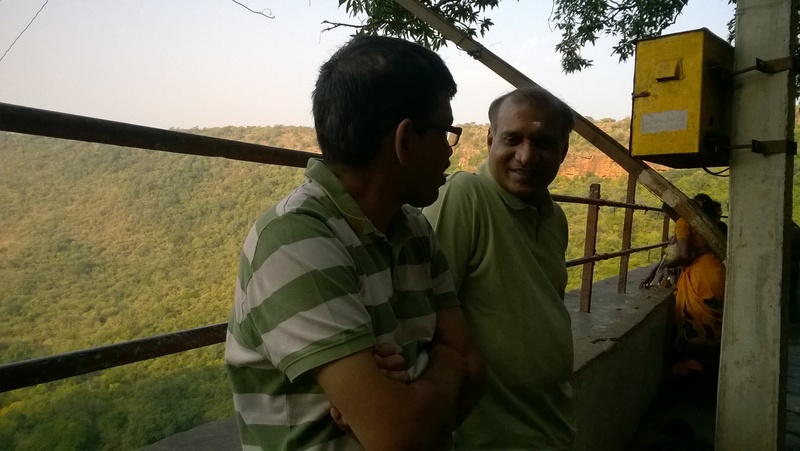 Ravi, my good friend had been suggesting that we go to Srisailam for quite some time. 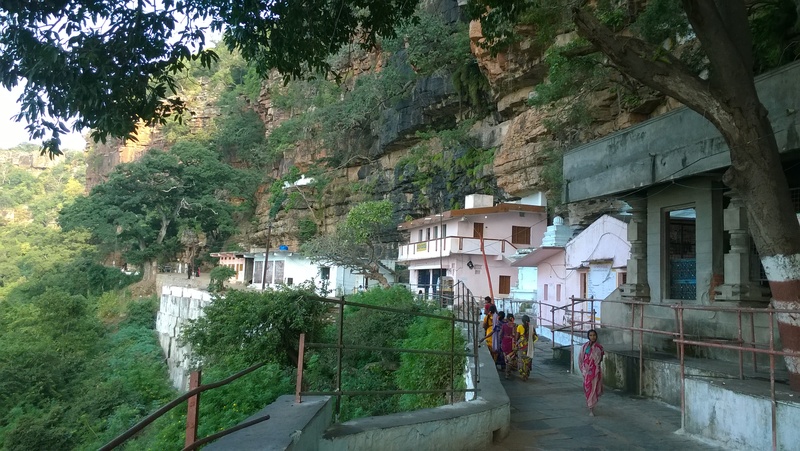 Ever since we had been to Mallela Teertham on motorcycles successfully, which is very near to Srisailam on its way (you can read our travel blog on that here). It took so long for that fructify eventually. This time we thought we will go with families. And by car. Although Sastry, my other friend took some time to decide between yes and no during a week of our deliberations, we are glad that it was finally a ‘yes’. Unfortunately his wife was unable to join due to unavoidable situation at home, but he made it up by bringing his most wonderful mother, and couple of other enchanting women. Ravi was accompanied by his wife and me with Komala. All the women gave us wonderful company all through each with their own topics to talk about. Sastry’s mother, bringing to table a life time of an experience, was very versatile and kept me engrossed with a lot of spiritual talk. She and I discussed a lot on meditation methods, of living life properly, why things are so in nature etc. 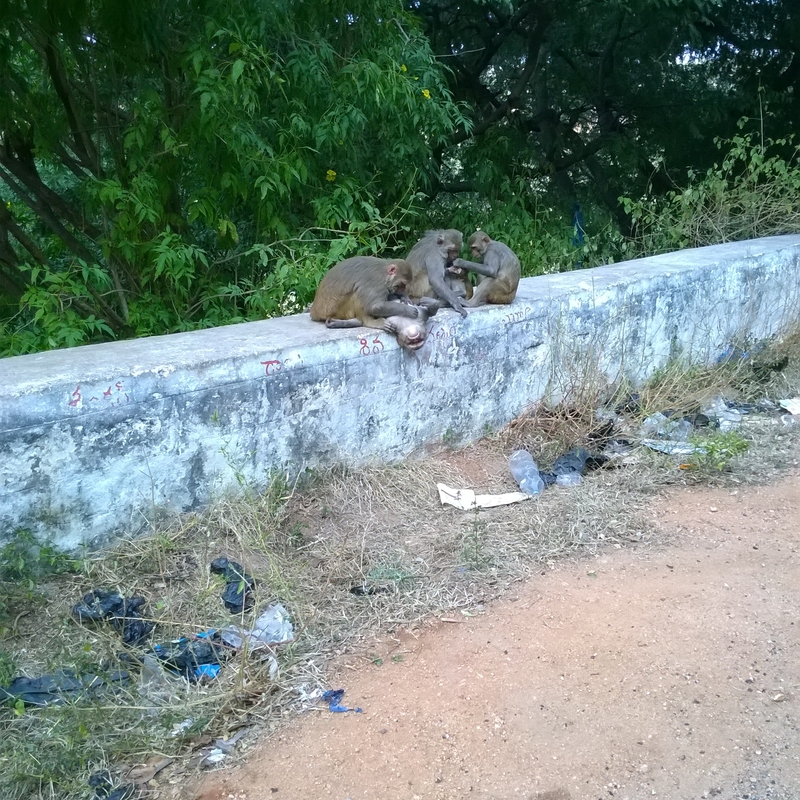 She gave me a lot of company as I was driving the car through ghats of Srisailam. There is a lot to learn from her. And it was easy for me to relate Sastry and his hobbies, and his talking style to his mother. It was clear that he bore quite a bit of his mother. It was amazing to know, she participated in an NBC TV channel program in New York, and impressed the program anchor. 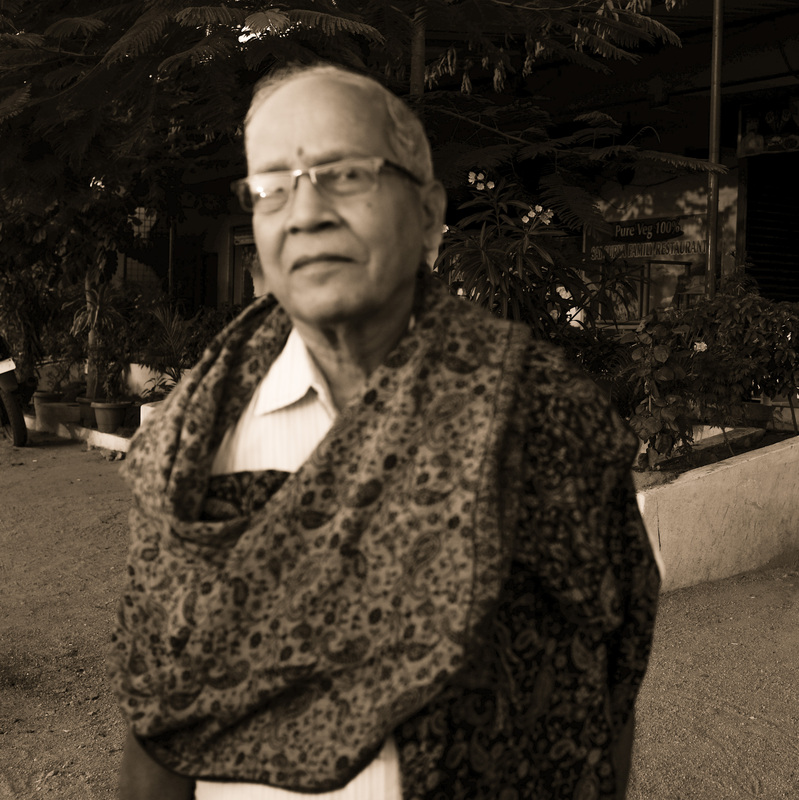 Sastry’s close relative, Jyoti, a modern woman was a good bridge between the old and the new, having the right balance. She never made me and my wife, Komala feel we had just known her. I felt sorry that due to small miscalculation of starting time, I might have unknowingly hurried her getting ready in the morning, when me and my wife picked her up from her home. It didn’t surprise me when I learned she was a teacher at a school. She seemed so natural at that profession. A good neighbor of Sastry’s mother, Kavya is someone you can’t stop admiring. Despite being a busy family woman, I was surprised how she was able to devote so much time for devotional activities and social get-together events. It was clear that she had many connections. 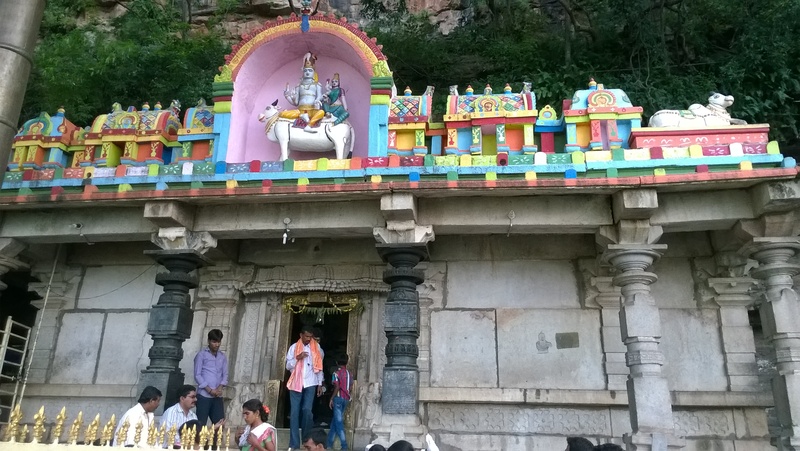 It was not therefore surprisingly at all that she had connections in Srisailam temple and was able to arrange a preferential entry to all of us enabling us join the Rs.100 ‘sreeghra darshanam’ queue directly. Ravi’s wife, Archana was such a soft spoken woman, just like Ravi himself. Did you hear that if one lives life with another for 6 years, the person becomes the other person after that period? She resembled so much of Ravi himself, who maintains his cool at least by speech at all times. Being a SAP Consultant herself, we were also able to discuss subjects of common interest. Under the veil of a working woman, I was able to see how much a typical family woman she was. The image I formed of her through Ravi explaining of her over times, only got reinstated that day, the last Saturday. She gave a wonderful company to my wife. As Ravi and I had our own favorite subject of automobiles being discussed all the time, I could over hear the two women in the rear seat were busy themselves. Jyoti’s father (uncle) who also joined us in the trip had good sense of humor and kept me engaged all through the drive. It was amazing despite his apparent age and weakness that might come along with that, his spirit was very strong. He wouldn’t even stop taking several ‘steep’ steps to visit ‘paapa vinashanam’ spot at Uma Maheswaram temple. The paapa vinashanam has a gundam that has water for ever, which is used to do abhishekam of the lingam there. 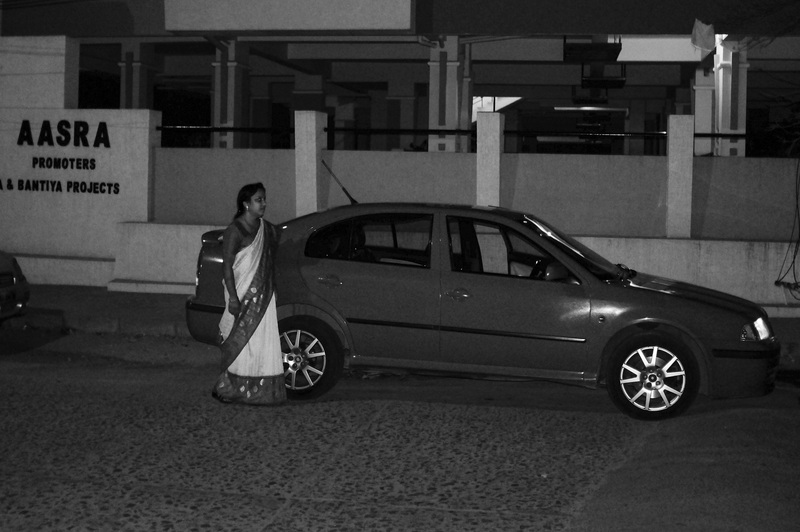 The times when I was driving Sastry’s car with all women behind in the rear seat, he made sure I was not missing Sastry in the car. He easily illustrated to me that day that if one’s spirit is strong, age is no bar for living life fully! 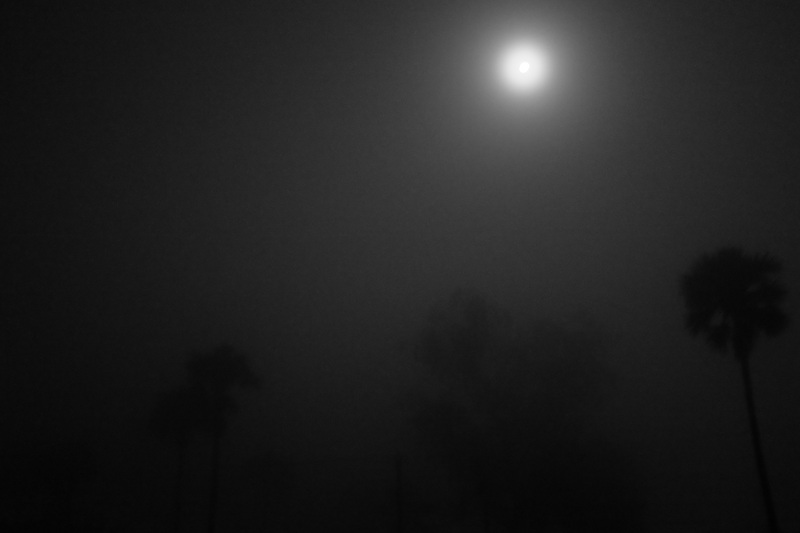 The day started, well ….. actually night, with me waking up at 2 a.m. Thanks to Ravi in retrospect, making the right suggestion to start early, I planned to leave 4 am from my home, and left then. I always need a couple of hours to get ready! On my way, Komala and I picked up Jyoti from her home near Lakdi-ka-pul. She was apologetic that she kept me waiting for few minutes, not knowing I am at home for any length of time when I have camera in my hand 🙂 I happily shot picture of Komala to challenge myself shooting well when there was no light! We went to Mindspace, my office to park my car. 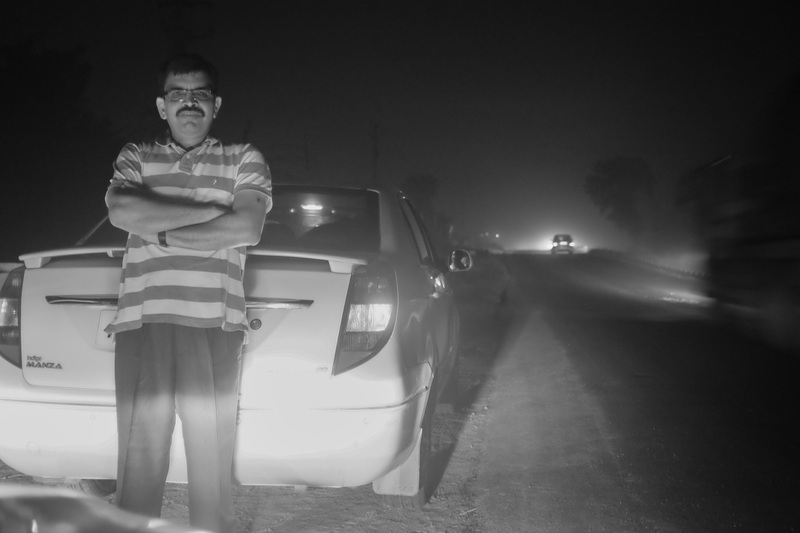 Ravi and his wife met us there so we could piggy back them in their car till Srisailam. It was an amazing morning. 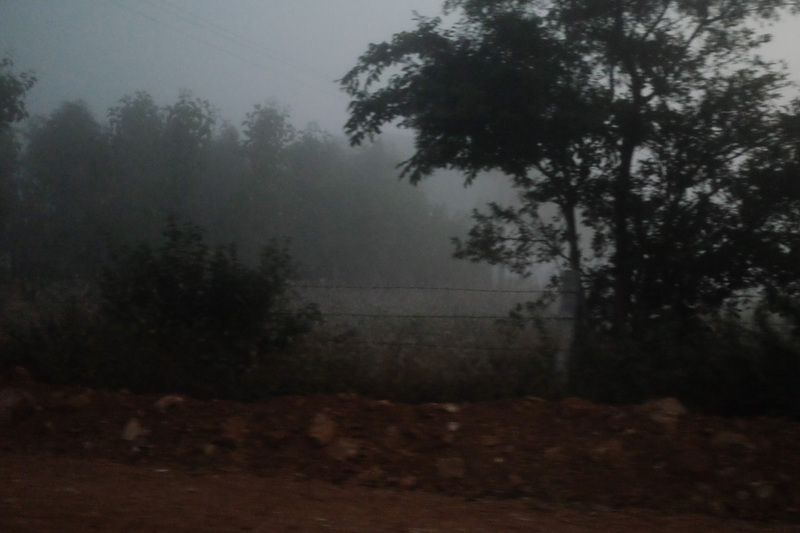 Never did I see so much fog right here in Hyderabad outskirts. 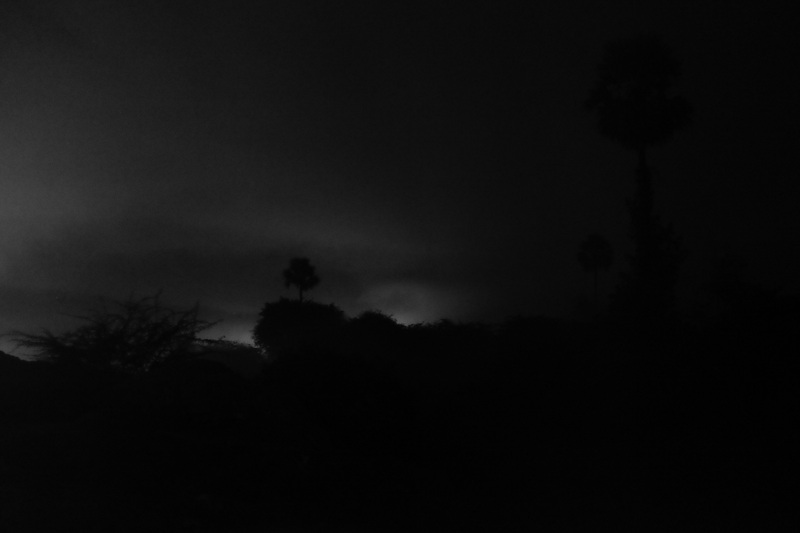 Just few kilometers onto Srisailam road it was barely visible to drive. Ravi exhibited well his driving skills to maintain decent speed even in thick fog. If I have been successful to any extent in capturing the mood here are some, for a picture is worth 1000 words. If I have a weakness to not stop shoot something that I shot several times, that is a sunset and sunrise. 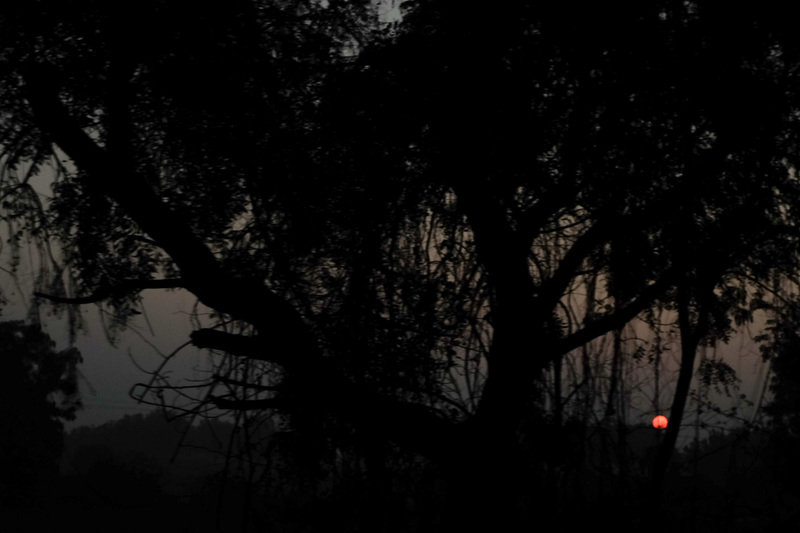 It didn’t matter if I was riding fast in a car, couldn’t stop shooting this beautiful sunrise through the woods! The ghat section going up Srisailam was among the hardest to me and Ravi’s wife (and I learned later to my wife as well to some degree). Despite a drive by car, the long curvy roads combined with steep climbs had taken their toll to me and Ravi’s wife, with us having a lot of nausea. I was afraid that I might throw up in the car. Stopping a few times on the way didn’t help either. Eventually, I took the advice of Sastry and Ravi, and took the steering wheel myself in Sastry’s car. They felt that my diversion towards concentrating on driving would help me get rid of nausea. They were right. Aside from that, me being in control myself of how steeply I turn, how much I accelerate and how fast I brake to tune to my own comfort level at that time seemed to help. As if to supplement this strategy effectively the charming ladies at the back and uncle in front passenger made me forget my vomiting sensation completely. It was a wonderful journey from then on. A sumptuous breakfast welcomed us at Srisailam. Things have changed so much in this temple town. Never did food tasted so well here as I ever recollect. 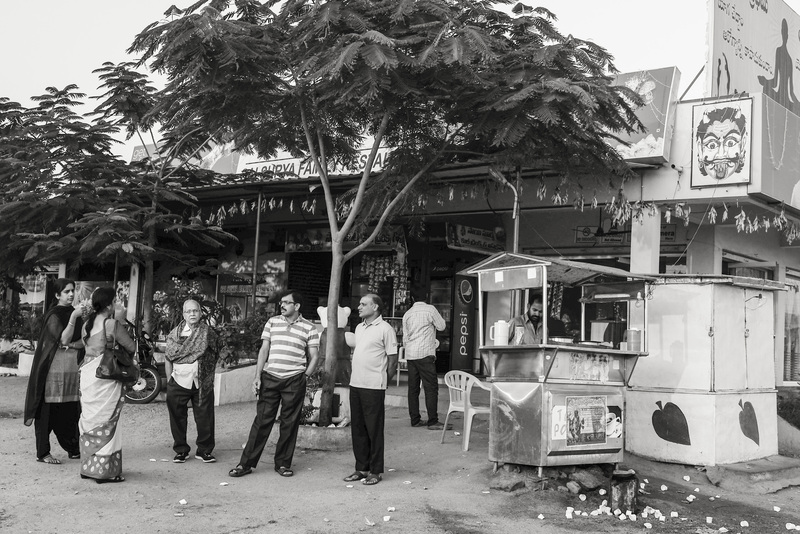 For I knew jolly well, if there was something difficult at Srisailam, it was always the food. But in recent times things changed quite a bit. I couldn’t believe myself that the idli chutney and ginger chutney was rather spicy to expect from this temple town. Thanks to Kavya’s influence, we were able to join the queue quite ahead of dharma darshanam. But to let us appreciate the fact that everyone has to wait for his turn to see God, we had to stay in the queue for two hours to have a THREE SECOND darshan of Mallikarjuna Siva Linga (that’s where I got my name from, as my parents vowed when my mom was pregnant). And the time spent on lighting the kaarthika deepam in clay bowls and few glasses of fruit juice et al, was an unknowingly spent hour plus. 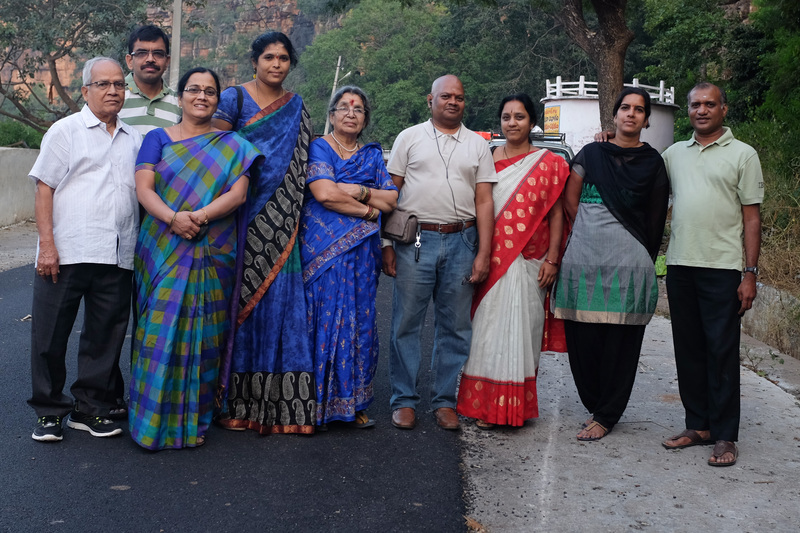 Add to this time spent at a free lunch at Arya Vysya Satram (although we each made some donations), we ended up spending a decent four hours at Srisailam. We were all happy that we could manage lord’s darshan, without having to wait too long in the queue. I was glad that Sastry and I supported the suggestion of Ravi that we start early in Hyderabad. Rather very early, at 4 am! Although it was difficult to wake up so early in the morning (aka night), it was clear that if only we were late to reach Srisailam by an hour, we would have been held up in the queue by another two plus hours. It was a maddening crowd that was adding up behind us. Several times I felt not just then that Ravi has a lot of experience and the knowledge that comes with it. It was no wonder I announced that I was going to drive myself the ghats again on our return. And it was a pleasure for Sastry to offer his car after a heavy lunch :). Through our return after Mannanur, we took a diversion on the left to visit Uma Maheswaram temple. What a wonderful drive and the place! The drive through the ghats was amazing. It would’ve been even so had I been driving my car (as obviously I would be more comfortable with what I was used to). With a motorbike wouldn’t that be much more exciting? How I wish, we friends visits this place again, only this time by motorbike. We all know monkeys are crazy. So crazy, despite knowing their craziness they drive us crazy by what they do. Here is one that lies flat on its back in an awkward position to be scratched and cleaned by its sibling or parent. 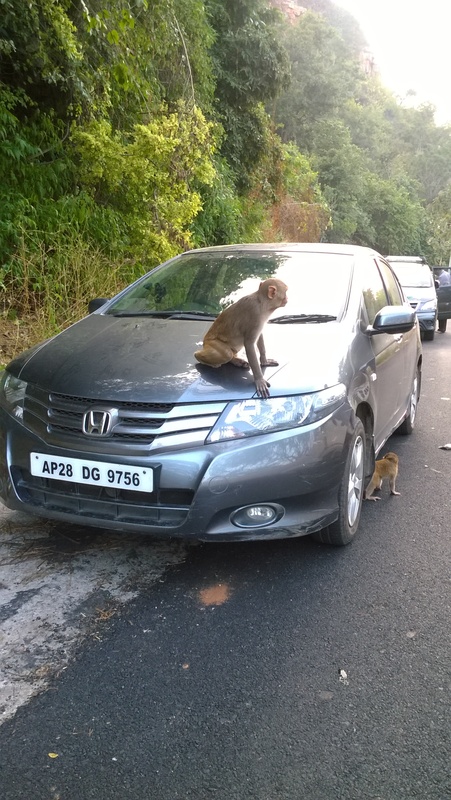 And another that gets on to Sastry’s car and starts jumping up and down on the car top (pictured one below is not that though). Wonder why? The return was a little uneventful, but that I had some amazing conversations with co-passengers. It was a little disturbing that a Ravi’s relation became critical as we learned from his sister’s call on the way. Thankfully he is doing well now. I picked up my car from office and reached home successfully completing the Srisailam. But I carry with me a life time of memories. And if I do miss some, here is the writing with an electronic ink to keep it on the cloud ever. For ever! I thank all my co-passengers to make this trip so wonderful, my dear wife included who is such a social person, is at home quickly with strangers! ← My Most Painfull Day in Life, what a dreadful day! I never want this repeated!